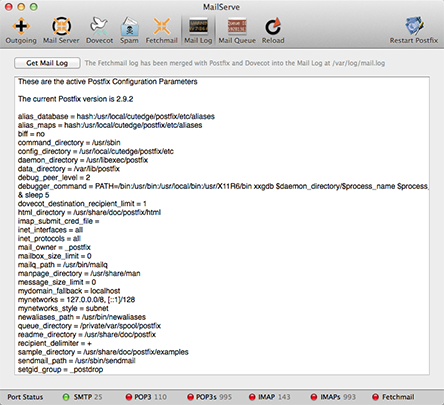 MailServe does a lot of complicated configuring of your server beneath its Mac-like user interface. It does this in a non-invasive manner, touching as little as possible of the original system files so as to leave your system in its pristine state. And you can remove all the files installed by the MailServe, at one go, using the De-Install option in MailServe's Help menu. Once you have launched the latest version of MailServe, save the current config using the File->Save menu item, do a De-Install from the Help menu, which removes all the previous cruft, and then quit and come back to the app. You'll then get the config files, libraries and the other stuff that will work with Mojave. 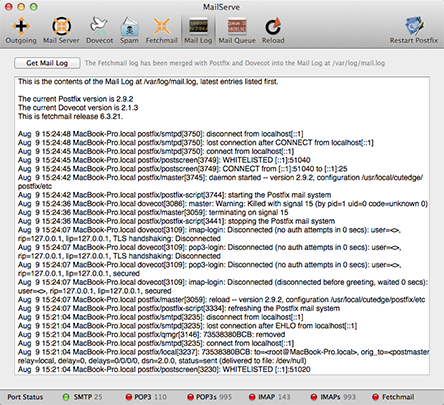 The Mail Log Panel provides access to the Postfix, Dovecot and Fetchmail logs as one merged stream. It also shows the current versions of Postfix, Dovecot and Fetchmail that's activated by MailServe. If you Option-click the Postfix Log button, you can get a list of the currently active Postfix parameters. Use this panel to monitor the mail queue. The Get button retrieves information about messages in the mail queue. You can flush the queue or choose a particular message to delete—useful for when there are messages stuck in the queue. You can de-install MailServe by using the menu item, shown below, in the Help menu. It will shut down any mail-related service that is still running, and remove all files installed by MailServe. MailServe works from its own folder in /usr/local/cutedge/postfix, in which are stuffed the main.cf, master.cf and other files used by Postfix. The original Postfix files in /etc/postfix are left un-touched and so MailServe leaves your system in its original state after de-installation. 12.0 October 2nd 2018. MailServe for Mojave released. The current Postfix version on macOS Mojave is 3.2.2. MailServe includes a new Dovecot binary, version 2.2.36 (1f10bfa63). 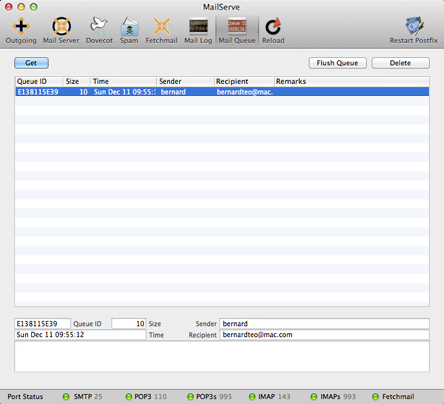 The Fetchmail version is still 6.3.26+SSL but this is the very latest version. 12.0.1 October 3rd 2018. This version sets the Postfix parameter "smtpd_tls_security_level=may” instead of “encrypt” in master.cf so that the mail server will not insist that clients must commuicate with it via SSL On the client, in Mail.app, set “Allow insecure authentication” to on, for both the Incoming and Outgoinig Mail Server, if you want Mail.app to communicate with the mail server without SSL (e.g., if you don’t have an SSL certificate). To get this new functionality, there’s no need to do a De-Install. Just do a Restart Mail Server. 12.0.2 October 4th 2018. Added a “Use Plain Login” checkbox to the Outgoing Panel (to the outgoing smtp relay host parameters). This is needed, e.g., if the relay host is smtp.gmail.com, which requires the password authentication mechanism to be of type “plain”, or some such similar smtp servers. If you’re having trouble authenticating with a relay host, try with this option set. 12.1.2 March 30th 2019. The log is back. This is the first version of MailServe that includes its own build of Postfix and the SASL authentication libraries. The Postfix and Fetchmail log is now at /var/log/postfix.log. It can be viewed from MailServe’s Log Panel or via the Console app. And it will be rotated automatically so it won’t fill up disk space indefinitely. Dovecot now has its own log at /var/log/dovecot.log. Shift-click on the Get Mail Log button to access the Dovecot log. This will also be automatically rotated. The Postfix version is now 3.4.4. And Dovecot 2.3.5. Important Tech Note: To upgrade to version 12.1.2, assuming you’ve already opened 12.1.2, first do a Save (config) from the File menu. Then do a De-Install from MailServe’s Help menu. Then do a Open… and open the saved config file. Finally, Start Mail Server. The latest MailServe for Mojave version is 12.1.2 – The log is back! For important details of the latest update, please read the Release Log.